Images for print and digital edition of The Lutheran. Include photo credit (online linkable to www.cendrowski.com). Copyright remains exclusive property of photographer. Nayef Buteh, his wife, Feryal Jabur, and their son, Arab, moved to Dearborn, Mich., in November 2015 with the support of Lutheran Social Services of Michigan (LSSM). For nearly five years, a civil war has been raging in Buteh’s home country. More than 200,000 people have died in the conflict between the Syrian political regime and rebel groups, including the Islamic State (ISIS). War crimes have been committed on both sides, according to the U.N. In November 2015, Buteh, 45, arrived in Dearborn, Mich., with his wife, Feryal Jabur, 41, and son, Arab, 8. They are among more than 4 million people who have fled Syria since the start of the war. Lutheran Social Services of Michigan (LSSM) is accompanying Buteh’s family as they settle in the U.S. At the airport in Detroit, they were welcomed by their caseworker, Nenos Akther. He brought them to their temporary home, which was stocked with food and other necessities. Initially Akther was in contact on a daily basis, assisting with Social Security cards, Department of Human Services benefits and doctor appointments. Buteh said he has helped his family a lot, and was available even when he called after working hours or on the weekends. “The first couple of months are very intense,” said Mihaela Mitrofan, LSSM’s resettlement program manager. Families with no U.S. ties, like the Buteh family, are guided by LSSM staff through safety, cultural and employment orientations to adjust to life in the U.S. The Buteh family, along with all others in LSSM’s resettlment program, were granted refugee status by the U.S. government. Arab (left) — with his father, Buteh — enrolled in public school in December 2015. “We were worried and thought it will be harder to adjust our life, but so far we are doing good and learning new stuff every day,” Buteh said. By early December, Buteh’s family had secured long-term housing and Arab was enrolled in school. Their next steps are English lessons and LSSM’s employment program, Mitrofan said. 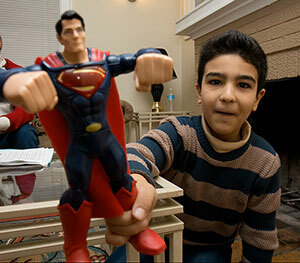 Arab, 8, plays with a Superman toy. Originally from Daraa, Syria, his family came to the U.S. “for a better life,” his father said. The U.S. government granted them refugee status. Today southeast Michigan boasts the largest Arab American community in the U.S. Since the early 1990s, LSSM has worked with local partners to resettle the growing influx of Middle Eastern refugees. It partners with Lutheran Immigration and Refugee Service (LIRS), which leads a national network of 23 refugee service partners. In 2015, LSSM helped resettle more than 556 people — 70 from Syria — in southeast Michigan. “Looking at the overwhelming need, the percentage is very small,” Mitrofan said. In 2016 she hopes that number can grow. LSSM has pledged to settle an additional 1,000 refugees beyond its 1,800 to 2,000 each year. But that depends on conversations between the State Department, LIRS and other partners. “The biggest issue that we’re dealing with right now is the position that the 30 governors across the country have taken: they’re concerned about the vetting process,” said Sean de Four, LSSM vice president for children and family services. These calls to rein in the number of refugees come in response to terrorist attacks in Paris; San Bernardino, Calif.; and beyond. LSSM is working with Michigan’s governor and the public to help them feel comfortable about welcoming Syrian and other refugees to the state, de Four said. LSSM staff report that they’ve received support from the community encouraging their ministry for refugees. Nearby ELCA congregations have stepped forward to support refugees, hosting English as second language classes, holiday parties, movie nights and dinners for their new neighbors. They’ve also sent financial and in-kind donations to LSSM. And local employers have offered training, résumé-writing assistance and employment opportunities for refugees. Collaboration is happening on a national scale as well. In December, LIRS convened a summit in Detroit for seven communities that are receiving increased numbers of Syrian refugees. LIRS resettlement partners, Lutheran and other faith leaders, government representatives, Syrian Americans, and professionals from business, health care and education met to learn about the refugee experience, including the difficult psychosocial issues Syrians face. Participants also discussed how to build “community and political will to welcome Syrian refugees,” said Linda Hartke, LIRS president and CEO. Since the synod is a companion of the Evangelical Lutheran Church in Jordan and the Holy Land, he said many area ELCA members are familiar with and have been moved to act to welcome Syrian refugees.